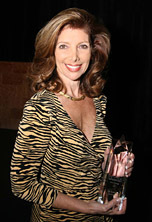 Dee Robinson was honored with the very first Stars of Design Award given for excellence in yacht interiors on Jan. 24, 2007 at the Design Center of the Americas. U.S.-built 180’ Mia Elise is a finalist for the 2006 ShowBoats Awards. This six-stateroom yacht is the third commission to Robinson from the same owner. Dee Robinson received a ShowBoats Award in Monaco June 27, 2003 for her work on Anjilis, which was chosen as the Best Semi-Displacement Motor Yacht Under 38 Meters. > Read part 1 of "Trends in Yacht Interiors"
With some 200 new yacht construction and refit projects to her credit, Dee Robinson is certainly a defining force in the world of luxury yachts. Her portfolio ranges from 70-foot semi-production models to 180-foot completely custom steel yachts. Dee Robinson has long been at the cutting edge of her profession. At Hatteras of Lauderdale, for example, Robinson broke new ground in the 1980s developing customized, high-end, turnkey interiors for production yachts. Her more recent projects include high-speed yachtfishermen, composite and aluminum tri-deck semi-displacement motoryachts and full-displacment, ocean-going megayachts meeting the highest standards of MCA certification. Demanding, multiple-boat completion schedules and the expectations of a vast variety of clients from the U.S., Asia and the Middle East have honed this firm’s sophisticated methodology for project management. Every single project has been delivered on or before its scheduled delivery date. In 2000, Dee Robinson Interiors won a ShowBoats Award for work 150-foot BELLINI, selected as the “Best Semi-Displacement Motor Yacht Over 38 Meters.” She followed this up with the 2003 ShowBoats Award for “Best Semi-Displacement Motor Yacht Under 38 Meters” for 124-foot ANJILIS. Robinson’s first fully certified MCA yacht, 180-foot Mia Elise, has been named a finalist for the 2006 awards. Dee Robinson Interiors also creates designs for custom residences. In addition to several waterfront homes, she has designed a grand luxury apartment in Boca Raton and a Palm Beach townhouse. Her most recent success is a Ft. Lauderdale apartment where she designed a unique luxury environment where the clients live among their fabulous collections of art, wine and Formula 1 racing gear. The residences she has designed for her clients -- many of whom also hired her to design their yacht interiors -- have been an exciting departure and allow design on a completely different scale. The Design Center of The Americas honored Dee Robinson with a Stars Of Design Award January 24, 2007. The Stars of Design Awards recognize the very best in Florida-based design talent. As the recipient of the inaugural award in the Yacht Design category, Dee Robinson Interiors will continue to set the standards by which other yacht designers are measured. Winners of the 2007 awards were selected by a distinguished design panel of renowned professionals and members of the national, regional and South Florida media. In making their award announcement the panel noted, "This year's winners feature the very best of southern Florida¹s most recognized designers in their respective fields." Joining Robinson in the winners' circle were eight other professionals in the fields of architecture, design, decoration and graphics. DCOTA, celebrating its 21st Anniversary, is the preeminent design center for Florida, Latin America and the Caribbean regions and the largest design campus of its kind. 3000 N.E. 30th Place, Suite 405-408 • Fort Lauderdale, Florida 33306 Tel: (954) 566-2252 • Fax: (954) 566-2044 • E-mail: deerob@bellsouth.net Copyright © 2004 Dee Robinson Interiors - All Rights Reserved Use of any content of this site, for any purpose other than personal viewing, is strictlyforbidden without the express, written permission of Dee Robinson Interiors and,as pertains to photography, the permission of the photographers themselves.